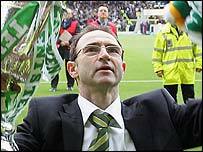 Celtic ensured manager Martin O'Neill bowed out with a seventh trophy to his name as his side beat Dundee United in the Scottish Cup final. Alan Thompson's 11th minute goal was the difference between the teams. The midfielder drilled a free-kick low towards goal and it came off United defender Garry Kenneth on its way in. Chris Sutton missed a late penalty to make sure of the win and Alan Archibald almost scored an injury-time equaliser, but his long-range drive hit the bar. The game's early exchanges were cagey, with both sides enjoying possession in their own half, without offering any attacking incision. But Celtic's first opportunity brought about the opening goal. Craig Bellamy won a free kick on the right, a couple of yards outside the penalty area. Thompson drove the ball towards the front post and as Bobo Balde allowed it to run through his legs, it came off Kenneth's heel before crossing the line. United's reply was a good run and cross from Jason Scotland, but Stevie Crawford just failed to make contact, with the goal at his mercy. Mark Kerr made a timely interception in front of his own goal to deny John Hartson an almost-certain second goal, and sloppy play by Kenneth presented Stilian Petrov with a shooting chance, but he fired wide from the edge of the box. Celtic were increasingly dominant as the first half wore on and Mark Wilson was forced to make a fantastic challenge on Thompson to prevent him doubling his and Celtic's tally after Sutton had put a dangerous ball into the box. Just before half time, Derek McInnes blocked Bellamy's goal-bound shot and Stan Varga headed just over from the resultant corner and at the other end Brebner rifled a shot wide as United finally put a meaningful attack together. A scintillating piece of play by Bellamy down the left almost led to a second Celtic goal shortly after the restart, but this time it was Archibald who denied Hartson the shot on goal. Having seen a one-goal lead reversed last week, Celtic looked in no mood to allow that to happen again, with Bellamy a constant menace, and the Welshman's run almost led to a Sutton goal, but again Archibald got in the way. The United defender was less fortunate at the other end when his volley flew over the bar. United were defending resolutely, and Bullock saved from close range from Sutton before pushing away a fierce Thompson drive from distance. Celtic passed up the chance of a second goal after Kenneth brought Bellamy down in the box, only for Sutton to slip as he took the penalty and the ball flew over the bar. Archibald almost took the game into extra time as he struck the bar with a powerful 25-yard drive, but Celtic survived that scare to take the trophy. Celtic: Douglas, Agathe, Balde, Varga, McNamara, Petrov, Lennon, Sutton, Thompson (McGeady 86), Hartson (Valgaeren 73), Bellamy. Subs Not Used: Marshall, Lambert, Beattie. Dundee Utd: Bullock, Wilson, Ritchie, Kenneth, Archibald, Kerr, McInnes (Samuel 76), Brebner (Duff 83), Robson, Crawford (Grady 83), Scotland. Subs Not Used: Colgan, McCracken.